"Express Your Right To Carry"
These are tactical black, high-quality 50/50 cotton/polyester t-shirts with a 2-sided imprint. This model has the HolsterSmith® official logo on the front, with the second-line statement "Express Your Right To Carry" below it. The reverse-side has "Holster Making Supplies" on it. These are very high quality! 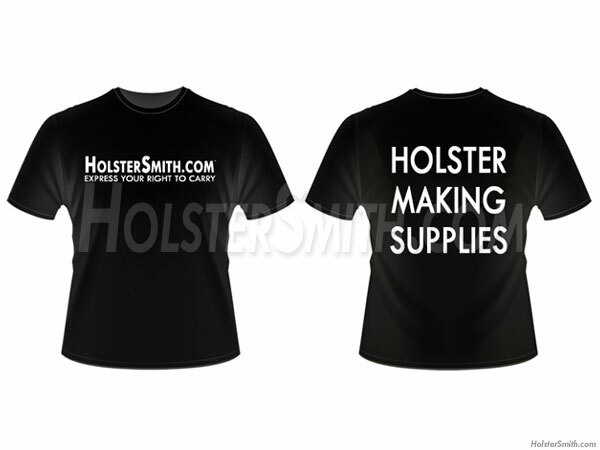 Front First Line = "HolsterSmith.com®"
Front Second Line = "Express Your Right To Carry"
Rear Message = "Holster Making Supplies"